Haute Residence welcomes Malia Cox Nobrega and Barbara Scrivens to its real estate network. As Haute Residence partners, Nobrega and Scrivens exclusively represent the high-end real estate market in Vail, Colorado. Nobrega and Scrivens have forged successful real estate careers, grounding them in exceptional local insights, technology savvy and commitment to customer needs. On their own, both Nobrega and Scrivens have earned coveted top-producer recognition and rank in the highest echelons of Vail Valley brokers. 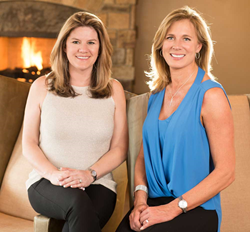 Vail Valley locals, both Nobrega and Scrivens have seen the region evolve, understand its uniqueness and know how to match the local resort lifestyle to their clients’ preferences. Nobrega hit the ground running early in real estate and was named “Outstanding Rookie” by Who’s Who In Luxury Real Estate in 2016. She is continuously one of the top producing brokers in the Vail Valley in dollar volume of sales and currently she is ranked 9th out of approximately 650 brokers in the Vail Valley based upon sold and pending listings in the last 12 months (as of 3/21/18). After an initial career in commercial litigation, and although she still maintains her law license, Nobrega changed her career from law to real estate when she moved back to the Vail Valley to start a family with her husband Jay Nobrega. She and her husband purchased Nobrega’s family real estate brokerage firm and property management company, which has operated in Vail since the 1970s. They sold that company in 2014. Nobrega now devotes her career to residential real estate sales with LIV Sotheby’s International Realty. She is a Regent for LuxuryRealEstate.com and the exclusive broker for the Haute Residence Luxury Real Estate Network for the Vail Valley. Scrivens brings extensive real estate, historical and community knowledge of the Vail Valley and applies these attributes for optimal results for her clients. A resident herself for 25 years, her sales production consistently ranks within the top 5 percent for the Vail Valley, exceeding $60 million in 2017. After years of running a high-end boutique real estate development firm in Vail Village, Scrivens was attracted to the strength of the Sotheby’s brand; centuries-old heritage of expertise, a global network and a reputation for delivering the highest level of service and results. With over 830 offices in 63 countries and territories around the world, Sotheby’s International Realty and dominate position in Colorado’s luxury real estate market is a powerful and compelling force for Scrivens’ clients.